Complete ERP Solution for Organizations that have fleets in the transportation Industry. These steps effectively improve the overall performance of the JMC City wide. In addition to this, the application will provide the users within the department to enquire about the status of forms based on various criteria and related information through web-based queries. The current manual system envisages different types of reports. These ATR’s can be engineered back into the system to give out the necessary outputs and reporting that the JMC Office needs to present to the Government and the Higher Authority. 1)Number of Fleets deployed on a daily basis. 2)Number of unfit fleets registered on a daily basis. 4)Maintenance Costs, Spare Part Issuance. 5)Purchase Streaming, Store Process Alignment compared to Revenue Generation. 6)Fleet management History and Driver – Conductor Records. 7)Operating Costs – Driver Wise, Fleet Wise, Route Wise Cost per Fleet. Customization:- Customizing to accommodate additional requirements from the JMC should be possible at a later stage if required. Reports: - A total of 25 reports as mentioned above shall be generated from the system and facility of direct emails of these reports shall be made available in the transport management system. 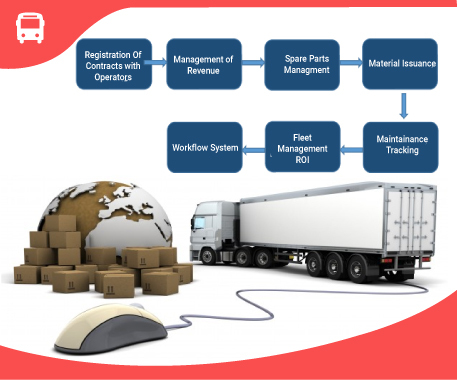 The Transport Management system, also known as Fleet Management system, creates a mobile system that connects the Government directly to the safety of the general public integrated, controlled and monitored by the backend office. In turn, this type of software improves Passenger Safety and Road Traffic safety, enhances customer service, automates paper processes, assists with regulatory compliance, reduces human error, and increases Revenue. In this field, proper scheduling of Field Officers, while maintaining an acceptable level of customer service or public acceptance, is often most important, because it determines, how effective fleet management service will become.